Banjul, The Gambia, Tuesday 19 February 2019 – His Excellency President Julius Maada Bio has told President Adama Barrow of the Republic of The Gambia that his government hopes to strengthen, widen and deepen the friendly relationship between the two sister-countries. He made the disclosure during a State Banquet organised in his honour by the host President and people of The Gambia, who were celebrating their fifty-fourth Independence Day on February 18 this year. Welcoming his colleague, His Excellency President Adama Barrow expressed happiness for having President Bio and his entourage in his beautiful city of Banjul for the first time since he was voted president of the Republic of Sierra Leone. 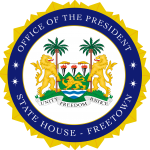 “Sierra Leone and The Gambia has long-standing relationship and friendship. I am happy that we have him here in Banjul and I want to congratulate my brother for transferring power from a military rule to democracy, particularly during those days when his military counterparts were enjoying their military rule. It was a bold step and I must commend you for that,” he said. President Barrow told the banquet that he was also very proud that President Bio was adequately representing them as the Chairman of African Union Committee of Ten Heads of State and Government on the United Nations Security Council Reforms (C-10), adding that African leaders would not be disappointed at the effort of President Bio. He also said that he was happy to hear news that President Bio was working hard to deliver on his promises and trying to uphold the tenets of the Rule of Law. He noted that he was going to emulate the leadership of President Bio, particularly in terms of adding relevance to education through human capital investment. “Sierra Leone and The Gambia can do a lot together in creating extra opportunities that are beneficial to both countries,” he said. In response, His Excellency President Julius Maada Bio said that he and his delegation were deeply proud of and honoured by the wonderful reception and hospitality from the people of the Republic of The Gambia on his first visit after his election as President of Sierra Leone. President Bio congratulated them on the celebration of their fifty-fourth Independence, particularly for participating in a democracy that was geared towards producing sustainable development. “I congratulate you, Your Excellency, for winning the democratic elections and admire your efforts in sustaining the gains so far. I also congratulate the people of The Gambia for their roles in maintaining peace in the country. The relationship between Sierra Leone and The Gambia has spanned over 300 years. We share similar experience from the day of this country was a protectorate and colony from 1821 through the struggles of Independence. My country attaches great importance to this historic relationship that has seen the endless flow of our needs,” he concluded.